WonderSwan © 1999 Bandai Co., Ltd.
A handheld game console released in Japan by Bandai It was developed by Gunpei Yokoi's company Koto Laboratory and Bandai. Released in 1999 in the fifth generation of video game consoles. 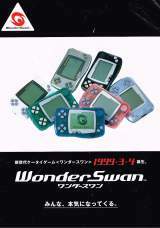 Koto Laboratories claims that the WonderSwan sold 3.5 million units and 10 million game cartridges in all.